Here's my first report from the road on the Great Grand Genealogy Tour of 2014. I was in Washington June 27 - 29. There is a sizeable Norwegian community in Washington. The Fagerland branch of the family started settling there in the 1950s. (1) To tap the memories of Orville Fagerland, my oldest living relative. (2) To look for a picture of my 2nd-great grandparents Fagerland. (3) To see a collection of family artifacts at Pacific Lutheran University. I was met by my cousins-once-removed, sisters Joyce, Marlys, and Lorraine. They are all daughters of Mabel Fagerland-Gullickson, my grandfather's late sister. They were a fun group with old memories. Joyce remembers being baby-sat by her uncle Warren, my grandfather. She also remembers her grandparents, my great-grandparents Knut and Augusta Fagerland. Joyce recalled the time she fell down the stairs in the old Fagerland house and skinned her knee. Augusta treated her with a beverage of Postum, a coffee substitute. Knut completely surprised Joyce by showing up to her wedding in Washington. The cousins gave me the names of all their descendants for my family tree. The house still stands -- you can see the frame where the side-wing was lost. 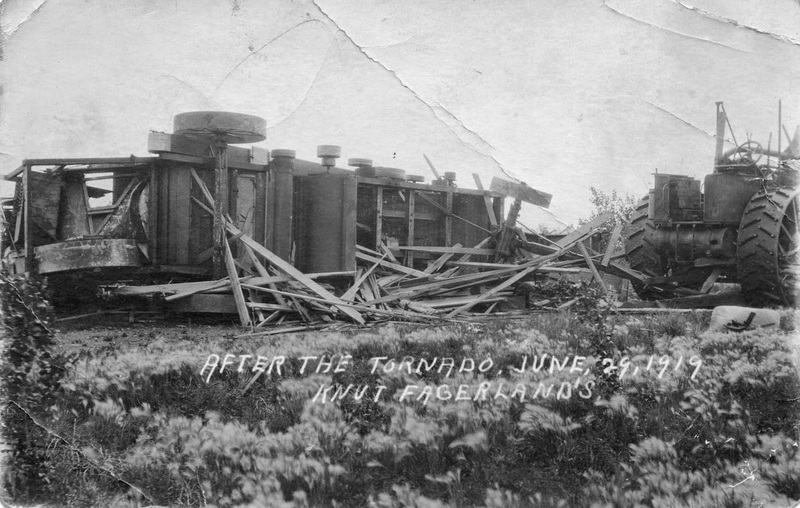 Photo taken immediately after the tornado of 6/29/1919. On the left is a thresher that was blown over. I asked Orville about his grandparents, my 2nd-greats. The one he remembers best is his dad's dad, Ole Fagerland. Ole lived nearby, and died when Orville was 11. Orville said, "Every time I saw him, the only thing I ever saw him do was patching the barn." He was a farmer / carpenter, the same sort of self-surviving pioneer as most men in that place and time. 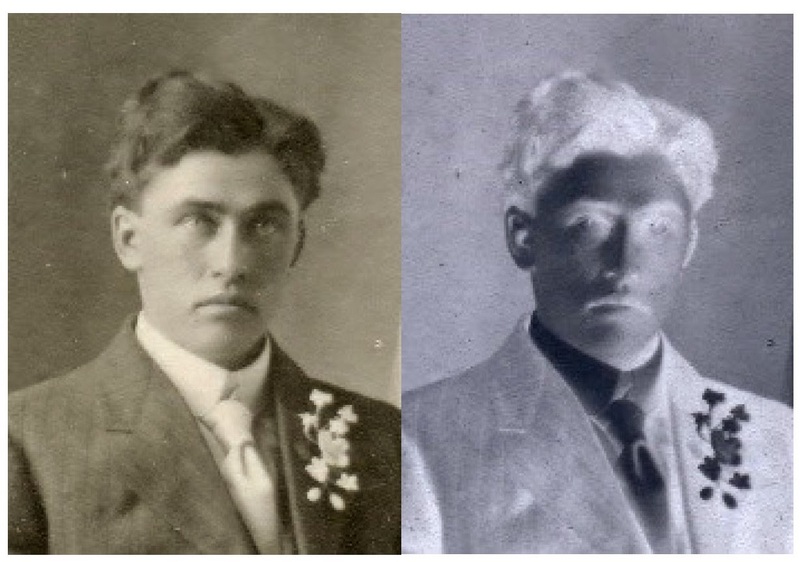 Orville said that he doesn't remember much more about Ole, including what he looked like. "Everyone in town said he was pretty easy-going," he explained. Ole's wife Mary died when Orville was two. "Nobody ever talked about her much," he said. (That's frustrating, because she is a stubborn dead-end in my family tree). Orville vaguely remembers seeing his grandparents Sandver at some family occasions, but doesn't specifically remember interacting with them. Finally, Orville shared some fascinating, important, but unpleasant memories about his father, Knut. Though Knut put on a good face for his community (and even his grandchildren) "he could be a skunk in his own home," said Orville. He was apparently stressed out by frontier life, and he vented his frustrations unhealthily against his wife and kids. I'm not sure exactly what the nature of his behavior was. I suspect it was primarily emotional abuse. Orville said that Knut did not drink, but had a gambling problem and would sometimes lose the week's grocery money. (He eventually lost his farm). The household reached a breaking point one day in the mid-1930s. Knut got so upset that he started slapping his wife around. The kids jumped in to intervene. "Mom held him down, and we all beat him up pretty good. We told him to get out," recalls Orville. This day was deeply traumatic for the family. I've heard it said that Deloris, the youngest child, went mute for a year afterward. My grandfather still won't talk about it to this day, eight decades later. My great-grandfather Knut Fagerland, in a high-quality scan that I acquired from Orville. He had a dark side. Knut did move out into a shack of his own. Orville says that Augusta eventually filed for divorce. Over the years, the family was able to forgive Knut. He attended family occasions for the rest of his life. Knut's parents, my 2nd-great-grandparents Ole and Mary Fagerland, are a mysterious branch in the family tree. As I've mentioned, we hardly know anything about Mary at all. Even Knut, who compiled a family tree, indicated only that her maiden name was Anderson. These are the only 2nd-great-grandparents for whom I don't have pictures. My 2nd-cousin Kristy Morrical says that there is a picture and she believes she has a copy. Unfortunately, Kristy wasn't able to meet me on this trip. The mystery remains! Joyce said that she will put the word out to other relatives and see if someone can find this picture. "Svare" was the birthname of my dad's dad's mom's mom, Ymbjorg Svare-Sandver. I learned that a distant cousin, Richard Svare, had left many of his possessions to the Scandinavian Cultural Center at Pacific Lutheran University in Tacoma, WA. I went there not knowing what to expect. The most interesting piece in the collection was this water-painting of the church in Vaga, Norway where the Svares came from. "Svare Church, Vaga. Originally a 'Stave-church,' 10th century." (Note: This is the traditional style of wooden church architecture). "Restored and altered in 17th c. Svare pew from 17th c. -- name in script on pew door."